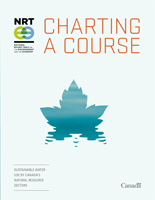 The natural resource sectors use and consume more water than any other sectors in the nation, accounting for approximately 86% of Canada’s water use in 2005.
promote further collaborative water governance in appropriate circumstances, such as in the need for water strategy development. Historical water use by the natural resource sectors shows improved water-use efficiency for most sectors, even in the absence of water policies to motivate such efficiency gains. Economic instruments (EIs) and voluntary initiatives have real potential for contributing to the goals of improving water conservation and water efficiency. A lack of reliable, publicly available data on water quantity has negative implications for current and future water resource management in Canada. Effective collaborative water governance requires the involvement of a broad range of stakeholders. Water has value — in economic, environmental, and social terms — and should be managed in trust without harm to its sustainability or that of the ecosystems in which it occurs. Water must be conserved and used efficiently. Water governance and management should be adaptive. Water governance and management should be collaborative.